The original Jurassic Park turns 25 years old in a couple of days, which is a hefty cross for J.A. Bayona's fifth entry in the franchise to bear. But the Spanish horror director handles the task of a new Jurassic movie with style, and even manages to add something new to the near 30 years of dinosaur canon. 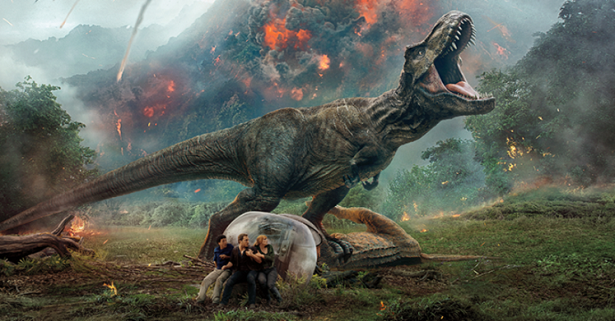 Topping 2015's Jurassic World wasn't going to be hard, but with Fallen Kingdom, Bayona manages to craft something that almost feels new... at least once you get past the opening 30 minutes, which essentially rehash the plot of Jurassic Park: The Lost World with a volcano and a lot more explosions. Once the island erupts, however, Bayona really finds his footing, showcasing a knack for directing massive action that we've yet to really see from the filmmaker. But no one who saw his vastly underrated A Monster Calls will be surprised to discover that he manages to humanize the lumbering prehistoric monsters who are slowly coming to terms with their fiery fate. The film's central duo is given far more to work with in this entry. Bryce Dallas Howard's Claire has an entirely different personality from the first movie, which, while a vast improvement, is never really explained by Trevorrow and Connolly's script. Granted, she and Owen are still the least engaging characters in the film, so it's handy that their supporting cast is excellent, with their young cast mates seeming like a fantastic choice to front the inevitable sequel. Justice Smith's Franklin, Daniella Pineda's Zia, and Isabella Sermon's Maisy add a much needed freshness to the cast, almost giving the film a young adult feel, which is exciting and much closer to classic '80s and '90s family films than your average modern blockbuster franchise. Bayona's background in horror really shows. Once the action heads back to California and the estate of John Hammond's excommunicated old partner (played by James Cromwell), Jurassic World: Fallen Kingdom goes full gothic terror with a giant mansion, a child with a dark secret, and a dying old man. Rafe Spall's villainous Mills works really well alongside Toby Jones' mercenary business man Gunnar Eversol as the mustache twisting billionaires who can't wait to exploit the creatures of Jurassic World. Bayona treats the huge Lockhart estate like it's a spooky house haunted by the misdeeds of the men who built it... oh, and by dinosaurs, of course. Yup, the second and third acts of Jurassic World are essentially Insidious but with a genetically modified raptor hybrid, and it's at times genuinely terrifying. Bayona uses space magnificently, whether it's the introductory shot of the colossal gate opening into the thought-to-be-abandoned Mosasaurus lagoon on Isla Nublar, or Maisy cramped into the tiny dumbwaiter pulling herself up through the eves of the house. What's more, the director manages to imbue every moment with a palpable tension. Though he could go for easy jump scares, Bayona prefers to tease the reveal, with plenty of tricks of the light and glimpses of the horror to come. That also creates a far more realistic look for the special and visual effects provided by Industrial Light and Magic, leaps and bounds more living and breathing than the computer generated creatures that filled Colin Trevorrow's vision in Jurassic World. Ultimately, Fallen Kingdom commits to its hard sci-fi roots, making some bold choices that seem to fit far more in the world of a Michael Crichton book than a Hollywood franchise. For this reviewer, it worked. The film's attempts at a message about the lives and rights of the creatures we create hit home in a way that the franchise has often missed out on. A third act reveal will be unlikely to surprise, but it's a fun twist that is well built up by Bayona and crew, with one of our new recruits playing a refreshingly vital role in the survival of the core cast in the sprawling mansion. Jurassic World: Fallen Kingdom's biggest achievement is what it promises us in its final moments. As Jeff Goldblum's dulcet tones issue a terrifying warning, we get a glimpse at a brave new world. It's one that many of us have wanted to see since we first read the notorious unmade script for Jurassic Park 4, or even since we saw the T. rex on the boat to the mainland in The Lost World. The Earth has been irrevocably changed by the men who dreamed of bringing these ancient creatures back to life, and as three pterodactyls fly across the sun echoing the final moments of the original movie, you can't help but want to see more of this Jurassic World.